We don't notice at first glance, but there is amazing order in nature. Look to the humble honeybee for just one example. She buzzes about keeping the cycle of life moving as she pollinates flowers and plants. She can always find her way back to the hive, no matter how far she flies. The hexagonal honeycomb could have been created by a famous architect, but this stylish structure is built by tiny insects. You work just as hard as those busy bees, so we thought you could use a bit of a break. Stick these self-adhesive address labels on all your outgoing mail to save yourself the hassle of writing your return address on every envelope! 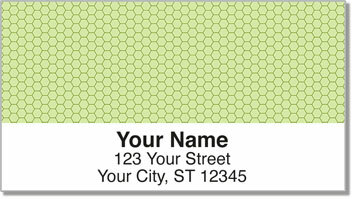 Get your own Green Honeycomb Address Labels now! We also offer matching check designs.